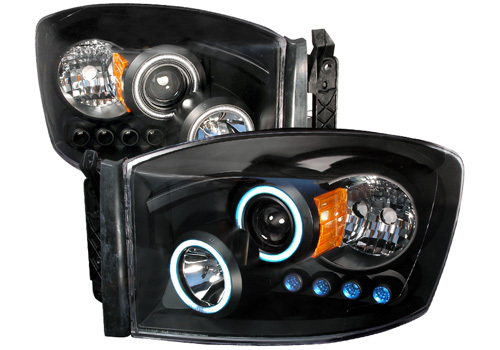 Black CCFL Projector Headlights With LEDs 06-08 Dodge Ram Black CCFL Projector Headlights With LEDs 06-08 Dodge Ram, Spec-D 4LHP-RAM06JM-KS Headlight, 06-08 Dodge Ram Black Projector Headlights, 06-08 Dodge Ram Projector Headlights, 06-08 Dodge Ram Black Headlights, 06-08 Ram Black Projector Headlights [Spec-D 4LHP-RAM06JM-KS Headlight] - $369.95 : 3rd Strike Performance, Your Source for Late Model MOPAR Performance Parts and Accessories! Truly stand out from the crowd with a set of Spec-D Projector Headlights. Spec-D has made a name for itself in the automotive industry with it's advanced Dodge Ram Projector Headlights. Every set of Projector Headlight have been test fitted to match your Dodge Ram's exact specifications. These headlights have been weather sealed to guarantee the best possible resistances to various climate conditions. Projector headlights provide a stronger, more concentrated light output to provide the best possible visibility. Spec-D is on the forefront of Dodge Ram Projector Headlight technology with it's innovative headlight designs. Each Projector Headlight has been framed with LEDs to provide the most advanced form of lighting possible, while also adding to the sleek look and style. Available with chrome-plated or black housing, you are sure to find a style that fits your Dodge Ram. Installation of your Dodge Ram Projector Headlights is a simple process that can be easily done at home without the use of specialized tools, however some wiring may be required. Spec-D has gone through every process to make certain it's Dodge Ram Projector Headlights are DOT approved, so you can rest easy knowing you can drive down the road safely. Spec-D stands behind it's products so soundly that all Dodge Ram Projector Headlights are backed by a 90-day limited manufacturer warranty. Spec-D has separated itself from the competition when it comes to Dodge Ram accessories, and has no intentions of slowing down anytime soon. Dramatically increase your viewing capabilities while shooting the style of your Dodge Ram through the roof. Maximize your Dodge Ram's potential today with a set of Spec-D Projector Headlights. Adding HID bulbs will void warranty!